Tune Raider is Pamm Legg, signed to Spectral Records, Twenty4Seven Records and Magnetika Agency. Last year in August we interviewed Tune Raider, but since then she has been on a successful tour of Brazil. 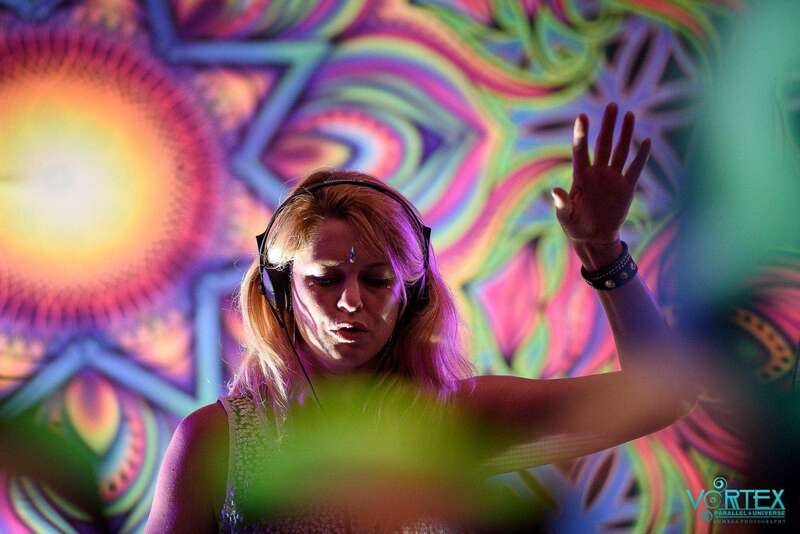 We decided to have another chat with the top South African female Psytrance DJ, to speak about the tour, and what to expect this winter season. Plus we’ve included a fresh exclusive 2013 mix with some brand new beats! Psymedia : Tell me about arriving in Brazil and playing the first gig. Tune Raider : I arrived in São Paulo in the middle of the night on the 7th March, all in good time for my first gig on the Saturday night 9th March. I never really understood what tropical heat really meant, but that first day was next level. Every step I took I literally sweated my face off. The afternoon was met by the biggest tropical storm I have ever seen – I thought Johannesburg was bad! Every afternoon until about 9PM it would rain heavily, but that didn’t stop us from making our mission into what seemed like the edge of a jungle to a small outdoor party for my first gig in São Paulo. It was small and fun, even though most of the night I communicated with the people I met using sign language and basic English – it was very entertaining. Psymedia : So it was hard to communicate? Tune Raider : Communication was very difficult as only a few people I met could speak English. Once I found someone who I could dialogue with, they became a close friend. Sometimes I would be alone in a house with someone who only spoke Portuguese, and thanks to Google Translate we were able to communicate sitting in front of a laptop, giggling at the fact of trying to figure out Google’s Direct translation. Sign language came in handy, yet still frustratingly confusing. Psymedia : Where did you stay? What was the culture outside trance parties like? Tune Raider : I stayed most of the time with Rosa Ventura, she was an amazing host. I lived in her studio for the duration of my stay. Things are very different over in the tropics, the one thing that I found so strange was this creepy gas truck. Picture this: a gas filling service truck that drives around the town, advertising itself with a creepy tune, and you can hear it for miles, and as it gets closer the sound gets louder. I tried to record it, but it didn’t come out so well. Anyway, that sound and the weird bugs that sounded like a wood saw – the combination freaked me out a bit I must be honest. One day a week there is a what Rosa called a ‘fresh market’. This market is in one long street in the little suburb and you really have never seen a fruit and vegetable market quite like it. Each table was bursting with colour and the nicest looking veggies. A traditional thing to do is sit at the little makeshift ‘restaurant type area’ and sip on fresh sugar cane and pineapple juice and eat ‘pastels’ – a pastry that is deep fried with either filling, chocolate center, banana or savoury prawn. It is nothing like you have ever tasted! It’s coated in a sweet yet salty cinnamon and sugar. I just loved seeing business men having their break and enjoying this local tradition on these plastic stools in the street. The sugar cane fresh juice was next level – just delicious. São Paulo city is literally ginormous. It stretches for miles and the traffic is like nothing we in South Africa have seen before. It’s a concrete jungle littered with colourful graffiti, complete works of art, everywhere you look every second building has something going on, and are linked together by a web of telephone cables. Each house is different, yet one can see the Portuguese influences in their tiled walls and block like shape buildings. The local corner café has a place where you can stand and enjoy your morning coffee and cheese ball (Pão de Queijo), which are very yummy but seriously fattening. One of the days Rosa, Marina and I missioned for a 24 hour backpack trip around Rio De Janeiro, it was such a treat. We boarded an overnight bus to Rio from São Paulo, and slept the whole way there. We arrived as the city was waking up. Unfortunately we couldn’t go up to the Mount St Christo as it was too cloudy, but I luckily saw it when I had a connecting flight the week before. We flew right around it, what a sight to behold- this huge Jesus statue, standing open armed to the world. Once we ate breakfast, coffee and Pão de Queijo (Brazilian cheese bread). We caught a few buses around the busy city, and then went to walk through the botanical gardens. It is lovely to see the vegetation and type of plants a different country has, some of the plants looked like aliens put them there, and seeing an orchard growing out the side of big trees was seriously fascinating. So normal in Brazil, but I have only seen a real orchid in Woolworths [laugh]. The best part of the botanical gardens were defiantly the monkeys. We walked into a real jungle type area, and were met by these cute dark brown monkeys. Very inquisitive little creatures, jumping from branch to branch, checking us out. Once we had enough of walking through the gardens we flipped a coin on where to go next. Copacabana beach front was the choice, and off we went to find a good restaurant on the beach. The streets are paved with black and white swirls that are apparently designed to imitate the ocean waves. Brazil is so decorative, and the street art is literally dripping of the walls spreading down to the ocean front, even the ‘Favela’ is colourful as it clung to the main hill in Rio. After a delicious seafood lunch and a chance to rest, we ventured onto the beach and found a little place to sit. The air was warm yet moist, and the beach was filled with people sitting or playing beach games, hawkers selling all sorts of clothes or souvenirs. My favourite was this guy selling bikinis hanging on a huge beach umbrella; you could see him from miles away, with colourful bikinis swaying as he walked. Marina and Rosa decided it was time I learnt some Portuguese and they both taught me how ask for a coconut fresh drink from the vendor on the beach. It is literally a straw stuck inside a coconut – so good! Anyway, with my South African accent, when I said coconut in Portuguese (‘coca’) it would sound like ‘kuka’! Tune Raider : The girls couldn’t stop laughing at me, and now made me super embarrassed to go say ‘uno coca porvavor’ (one coconut please). When I said it, it sounded like I was asking for ‘one kuk please’. Anywho I managed not to laugh when I asked the coconut seller for a coconut, but since then I have made damn sure I don’t ask for one kuk! It was starting to get cloudy and looked a bit like rain, so we ventured on along the promenade and enjoyed the sights of beautifully built sand castles, and ate ‘churros’ (cinnamon sticks filled with caramel). They were awkward things to eat in front of the men passing us on the promenade! We took shelter from the rain at a little bar, and Rosa ordered us a traditional mojito – my god! It was the strongest cocktail I have ever tried. Luckily we shared it. It was close to evening and we decided we wanted to go to a place called ‘Lapa’, but as we came out of the underground train station, it was pouring with rain. Luckily there was an umbrella seller, and the 3 of us huddled under an umbrella and missioned on. ‘Lapa’ is a little area in Rio, it looks like a street out of New Orleans, bustle bars playing live music, coffee shops and restaurants. We found ourselves in a pizza restaurant, we were still a bit early for a samba club. But by 9pm the 3 of us couldn’t go any further, our little legs were over it, and we said goodbye to Rio and headed back to the bus. Psymedia : How many parties did you play? Tune Raider : I played 9 gigs in total over 3 weeks. It was an intense schedule, the one weekend Rosa and I had 4 gigs. We literally ran off the one big stage at an outdoor, Rosa ushered me to the taxi, we jumped in and drove off to the next outdoor. We drove through the night and we had to sleep in the car between sets. I woke up at sunrise as the taxi was swerving the pot holes as we took a short cut through the tropical jungle, and as I sat up to see where in the world we were, I was privileged to see a flock of Toucan birds in a tree and flying around, absolutely free, I think I actually saw them smiling – they were so beautiful, so natural and free. Psymedia : What were the parties like? Tune Raider : My gigs were pretty crazy. The outdoor sets were very cool – nice big stages, great sound and an awesome dance floor vibe. The funniest thing for me was the people’s reactions when they saw this blond creature behind the decks. One by one they came to the foot of the stage to look and suss me out. It was hilarious the looks I got, but once I got the music flowing, I think the people realised I meant business, and they danced like there is no tomorrow. Great energy, these kids know how to have a good time. I played all sorts of gigs, big, small, club and outdoor. The ‘A’ Club gig was fun, a nice and big dance floor, energetic crowd that got more excited by every track. I had a gig in Belo Horizonte, a little city tucked in the hills. I unfortunately only stayed for one night, but had a fun adventure with Rica Amaral – DJ, producer, and one of the fathers of psy in Brazil. We had a great time traveling together, trading old trance stories and history of Brazilian and South African psy industry. On the way back from the airport, Rica took me through the streets of what would be the creative ‘arty’ area called Villa Madalena, and there is a little street dedicated to really amazing graffiti art, from wall to wall down a windy lane, crazy little shops, restaurants and bars. All in all, it was an amazing experience, I got to meet an amazing group of people and fellow female DJ’s. I loved how friendly and hospitable everyone was, even though the travel around the city is long and intense. It is also very efficient, Cape Town could do with a similar subway system. I would go back tomorrow if I could. Psymedia : Was there a particular reason you wanted to travel to Brazil? Tune Raider : I have always wanted to use my music as a way to travel and experience new places. Brazil is just one of the places on the Psytrance route , I have always heard that Brazil parties and trance scene is really big, and after meeting the team from the Respect Festival, their stories of their country and events really drew me in and I hope to go back and play again, hopefully for Universo Parellelo. Psymedia : How does South Africa’s scene compare? Tune Raider : Shew – that’s a hard question. The kids in Brazil like to party! Kids in South Africa like to party! That’s one definite similarity; I found that we all share the common excitement of good psy-trance music gives us , when I got the dance floor cooking nicely, I could see the same type of ‘Gees’ that we have on our dance floors there in Brazil, this just proves how music is ‘one’ language. The music is a little more psychedelic and progressive in the day time, and the night time stuff is really psychedelic in Brazil, and for us here in SA we seem to have a melting pot of different styles. All in all One Love, One Music. Psymedia : Where would you like to tour next? Tune Raider : I would like to go back to Europe and play in another part, maybe Sweden, Hungry or France, and one day in India, but that I would like to take Skragg with me. As a blonde girl, I would be a little nervous going alone. Psymedia : How do you think the approaching stacked winter season might differ from previous years? Tune Raider : It seems like more parties and club events, but the past seasons have been just as busy- on one hand its really cool that our local DJs are getting a chance to get more work, and I guess as long as no one is missing out because there are too many events on one weekend and not enough party people to fill the clubs- then it could work. But when there are too many events offering the same style of Psy Trance and promoters who don’t want to respect other promoter’s dates then it won’t work- that will split the scene in a negative way- so if there are a lot of different types of smaller events, such as Prog, Full-on day time, Twilight and Dark Psy -then the scene could handle it. Psymedia : Thanks for the interview, again! Any last words before we end off? Tune Raider : A big thank you to Rosa Ventura (my Brazilian Sista) and Marina, who helped make my tour possible, to all the party promoters that invited me to play-I loved every minute of it, and a big ‘Obrigardo’ and love to all the people I met along my Journey.